Can you identify the man in this photograph? 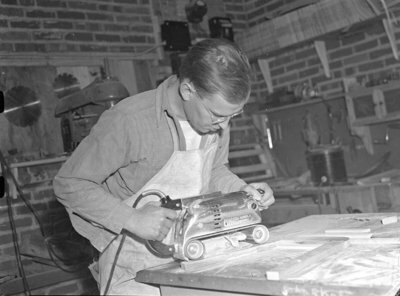 Black and white negative showing an unidentified man using a sander at Woodland Products. Woodland Products was started by two Whitby war veterans early in 1946. It was located at 600 Euclid Street and was eventually taken over by the William J. Anderson Company. Ruddy, Marjorie Georgina ; Anderson, William J.
Woodland Products, 1946, Marjorie Ruddy. Whitby Archives, 15-016-004.